There are 16 files within the zip. Half the files are Word and most have PDF versions as I have changed fonts and other items that will not show correctly on Word. However I have included them in Word so you may edit them for your class if needed. *The student survey and checklist are intermediate, the other forms can be for all grades. The half sheets are for the small half binders you can find at Target/Walmart etc. 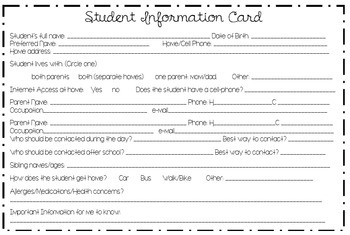 I keep each STUDENT INFO CARD and the COMMUNICATION LOG in that binder near my class phone which is easier access for myself and my students. There are full size info sheets and communication logs. 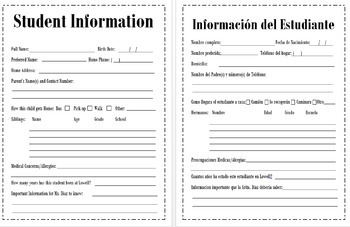 The full size parent and student info is in both English and SPANISH. That is translated along with the surveys and half sheets. This is updated. There is a student survey and a parent survey. The student survey I have the student's do for their first homework. 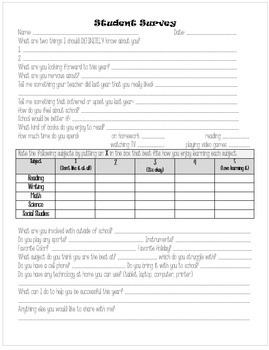 The Parent Survey is a new item I have created and will use this year. I have updated them for more helpful information. My old, simpler student survey is also included. 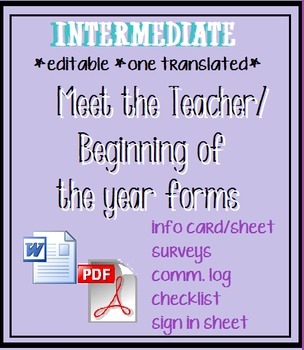 I started a checklist on Meet the Teacher last year which held the student's accountable for completing all items and gave them the first impression of what I expected of them. There is also a sign-in sheet in case it is needed. *If you just want a student/parent info and comm. log I have a free version in my store.